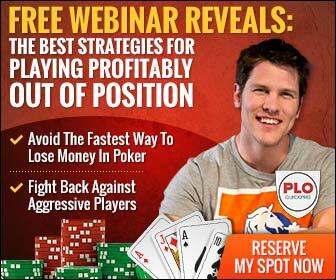 Let’s pretend you’re transitioning from NL to PLO… Or you’re completely starting from scratch. If you only had 90 days to learn the fundamentals and become a winning player… What would be the path you choose? What would be the best use of your time for learning off the felt? The biggest mistake that I regret, and that I STILL see 100’s of players making today is spending far too much time watching videos and reading poker books than on actually playing poker. It sounds ridiculous, right? 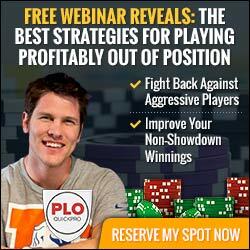 After all, I’m a PLO instructor.. And I own a PLO training site! So why am I telling you to watch fewer videos than you are now? Conventional wisdom suggests that the more information you have, the more accurate your decisions will ultimately be, and therefore the faster you’ll improve and the sooner you can start winning money playing this game… right? False. More information doesn’t necessarily mean more wisdom, and what I’ve found holds players back is the desire to constantly seek out new tactics and magic bullets of poker knowledge. Many new or transitioning players feel like they SHOULD be doing something, so they try to do EVERYTHING, including subscribing to sites with videos they’ll never watch, buying books they’ll never read (how many poker books are sitting on top of your toilet right now? 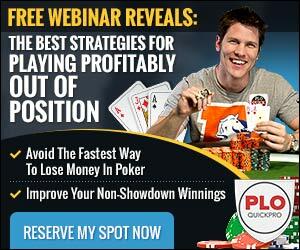 ), and distracting themselves from actually achieving their poker goals. In the video, I’ll tell you why focusing on consuming less poker training will actually help you in the long run (yes it’s costing me money telling you this), and exactly what to spend your time on instead of watching more vids and buying more training. With the WSOP beginning next week, I’ll be posting strategy updates, hand histories, and photos from poker’s biggest stage. I’m also going to be giving away pieces of myself to only players on my email list this summer – so keep your eyes peeled beginning next week for how to freeroll your way into the summer of sweats. LFG! !